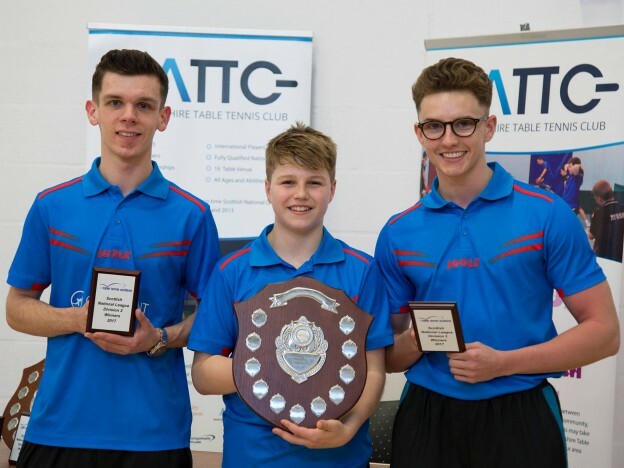 REPORT via TTS : The Scottish National League 2016-17 concluded on April 1st with all four divisions played at St Matthew’s Academy, Saltcoats where Andy Macpherson, Chris Barclay & Martin Johnson finished winners of a tight Division 2 and gained promotion to Division 1. The conclusion to Division 2 was particularly tight with three teams challenging for the title and promotion. North Ayrshire took the Division 2 title just a year on from winning Division 3. They completed their season with 4-2 victories over North Merchiston and Glasgow South A. Martin Johnson winning all four of his matches to complete an impressive season. North Ayrshire will have two teams in Division 1 next season. Fair City are the other promoted side with Robert Toth their top player. North Merchiston were the unlucky ones to miss out – suffering final day losses to their two main rivals. In part they can blame Gillian Edwards (who plays for North Merchy in the ELTTL!) who inflicted vital wins over Graeme Sutherland and Stewart Armitage. Drumchapel A claimed the Division 1 title with a win and a draw. Going into the day level with Murrayfield A, their morning clash with the Edinburgh side would be critical. In truth they were rarely troubled by a Murrayfield A side shorn of their of their strongest player (Kenny Lindsay). Murrayfield probably should have claimed the opening match in which Calum Morrison failed to convert a two-love lead against Calum Main whose forehand was misfiring. Main scrambled back and took a nervy fifth set 11-9. From then on it was one-way traffic with Liu Song far too strong for Calum Morrison and John Hannah. Drumchapel eventually easing to a 6-0 victory. Murrayfield A will still be happy with their runners-up position-the best the club has achieved since the re-formation of the SNL. In the final Division 1 match, host club North Ayrshire showed their pedigree by drawing with Drumchapel A. Liu Song was again a class above but each member of North Ayrshire’s team (Colin Dalgleish and the Main Brothers) chipped in with a win to secure the draw. Sepehr Bidari’s loss to Richie Main was his only reverse of the season- he ended on a high with a 3-1 win over Chris Main. In turn, Chris finished well-beating Calum Main 3-0 in the final match of the season, ensuring that his side finished in 3rd place. Many thanks to all those involved – North Ayrshire TTC for hosting the final day and laying on the buffet. This entry was posted in Latest News on 26th April 2017 by Chris Main.